Acumatica Summit is your best chance all year to network with other customers, meet Acumatica experts, get technical training, and find out the latest Acumatica news. This annual gathering of customers, partners, and Acumatica team members is held at the beginning of each year. At Summit, you’ll learn more about the current state of Acumatica and have opportunities to share your thoughts on our future direction and product development. Acumatica Summit 2020 will be held in Las Vegas, NV. To see videos of previous Summit presentations, visit Customer Portal. Acumatica Roadshows give the entire Acumatica community a chance to see new product releases up close, ask questions, and provide feedback. 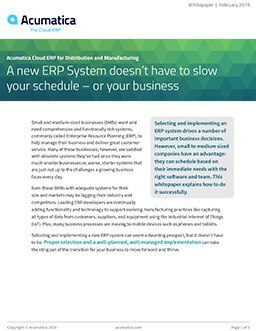 These events are held in major markets around the U.S. every time there’s a major new release of the Acumatica Cloud ERP platform. You can not only learn about Acumatica’s latest innovations, but also meet Acumatica partners whose solutions integrate with the platform to maximize your ROI. To get the most recent information about future Roadshows please visit Acumatica's events. Acumatica relies on a broad network of partners to help us deliver the cloud ERP solutions you need most. To help ensure that everyone is well versed in the latest enhancements to the platform and following best practices for cloud technology, we regularly offer webinars, in-person events, focus groups, and training around the U.S. To get the most recent information about future events please visit Acumatica's events. If you have lost connection to your Acumatica instance, please report the issue immediately. Also make sure to notify your Acumatica Reseller. Implementing an entirely new software system can be a tricky business. Find out five simple steps to get you started.